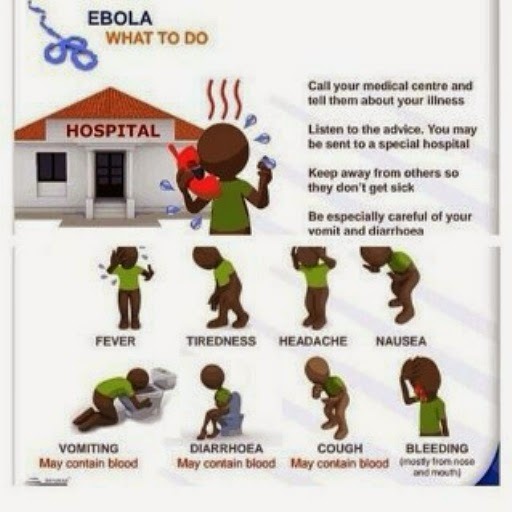 Apparently a case of Ebola Virus was spotted in Lagos so Nigerians are on red alert. If you never liked washing your hands now is the time to start. And if you won't have access to water and soap regularly, get a hand sanitizer and carry it every where you go. Always use it or wash your hands when you shake hands with people (or even hug). Avoid bush meat for now. Prevention is cheaper and better than cure. Stay safe people. Here is a pictorial on what the symptoms are and what to do. Hoping to get more pictorials on preventive measures. Stay safe and virus free..... REMEMBER WASH YOUR HANDS WITH SOAP AND CLEAN WATER OR USE HAND SANITIZERS that kill 99.9% of germs. Great tips! I hope the virus outbreak is controlled in Lagos fast! I hope it is quickly terminated before it infects other people. My family home, family, friends are in Lagos. Me i am scared to come to Lagos sef. God has to help us o..